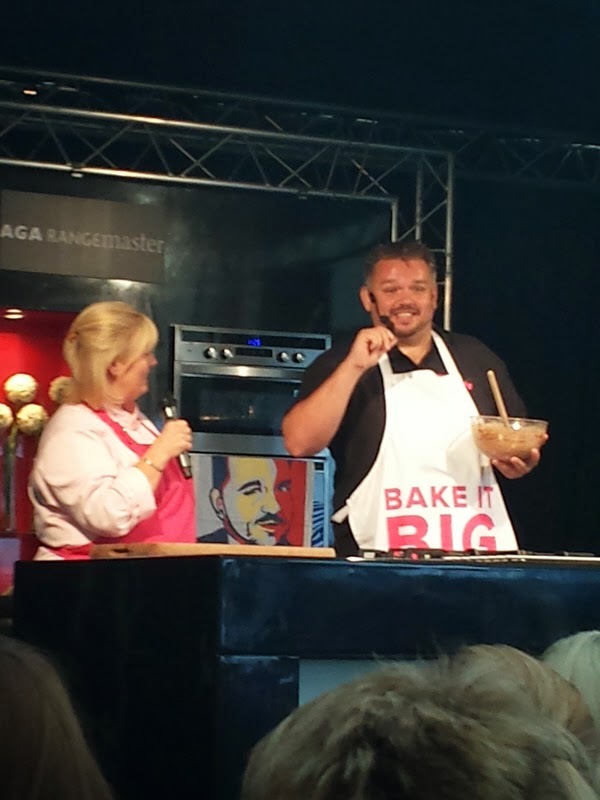 Premier Inn invited me to visit The Foodies Festival in Edinburgh to report on it. We drove over to Edinburgh after I finished work and my friend Alistair came with us as he was staying with a friend overnight before going to the festival too. 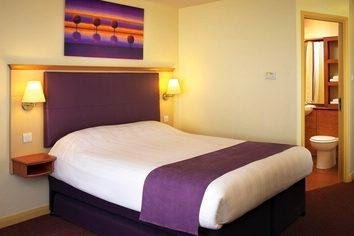 We checked in to our room in Premier Inn Leith Waterfront, which was rather nice, but then Premier Inn is always good quality. The Fringe is on just now and I had great plans that we'd have a wander around the old town to see some of the street performers, but it was just too late by the time we had dinner. From the hotel we walked to Ocean Terminal to have a spot of dinner. It was just too late to go further afield. 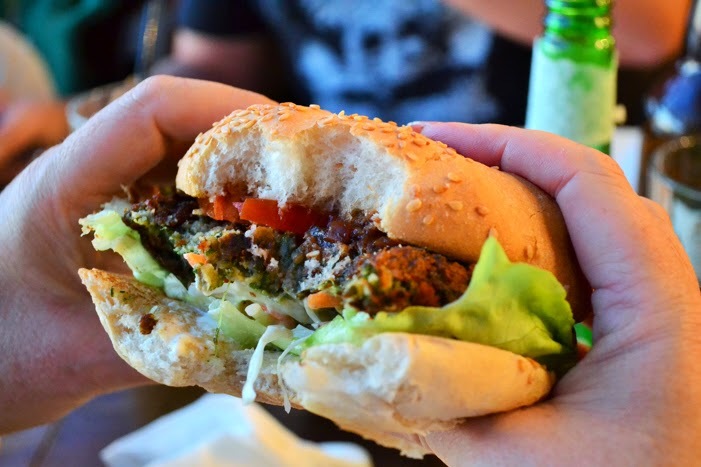 We decided to eat at Handmade Burger Co, who do a great range of freshly made veggie burgers. 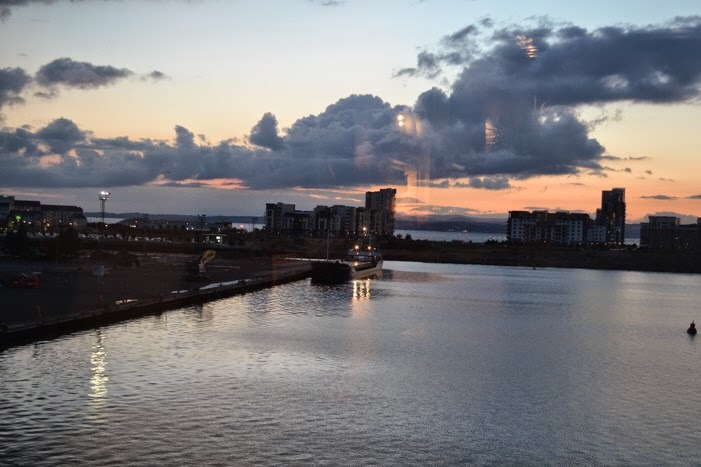 From the restaurant we had fabulous view across Leith, the burgers were great and the staff were really friendly. It was a nice relaxed evening. I had a Spinach and Lentil Burger with burger relish, lettuce, mayonnaise and tomato, Graham had a Cajun Vegetable and Bean Burger, Alistair had a Three Cheese and Baby Leek Burger and Cooper had Vegetable and Bean Burger, once he'd finished chomping on a corn on the cob. The burgers were great. Fresh and full of flavour. It's so nice to have lots of veggie options. The burger bun could have been more interesting, but that was a small gripe. We had more great views over Leith on the walk back to the hotel. After a good night's sleep, we enjoyed a leisurely breakfast in the neighbouring Brewers Fayre before heading to Inverleith Park. Graham and Cooper headed to the Botanic Gardens to take photos and I headed into the festival. It was a little drizzly as I arrived and unfortunately the weather got worse and worse. After texting Stuart (Cakeyboi) to see where he was, I met him and our friends Dave and Andrew in the Chef's Theatre to watch a demonstration by Glenn Cosby from the Great British Bake Off. He was rather funny and I chortled away and didn't pay much attention to what he was baking. 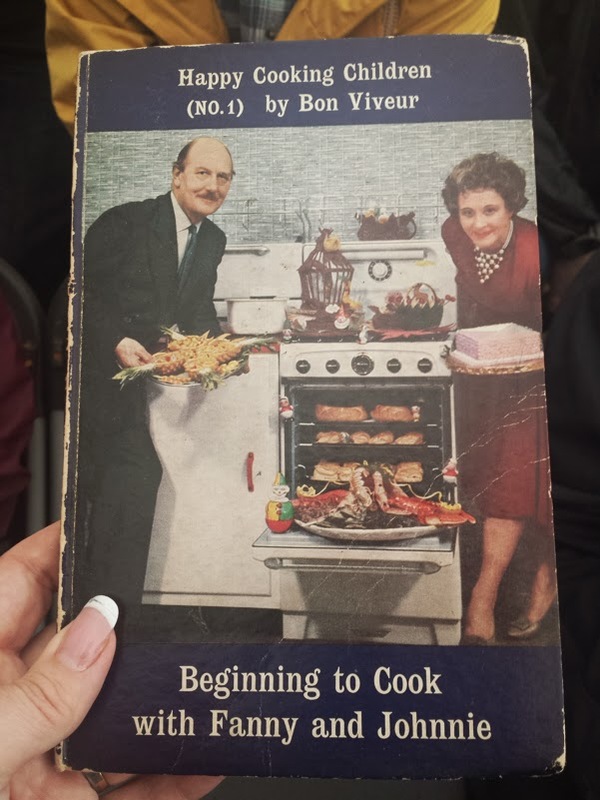 Next we headed to the Chocolate, Cake, Bake and Preserves Theatre where we met up with Genna from Blethering Boys, who was there with her hubby and friend. Last to arrive was 'Fanny' from Keep Calm and Fanny On. I'm afraid I'm not free to divulge Fanny's real name, it's top secret. With fruit ciders and non-alcoholic berry drinks for the drivers we settled down for the next two demonstrations thankful we were in out of the torrential rain. Those poor drenched people looking in on us in our dry seats jealously. 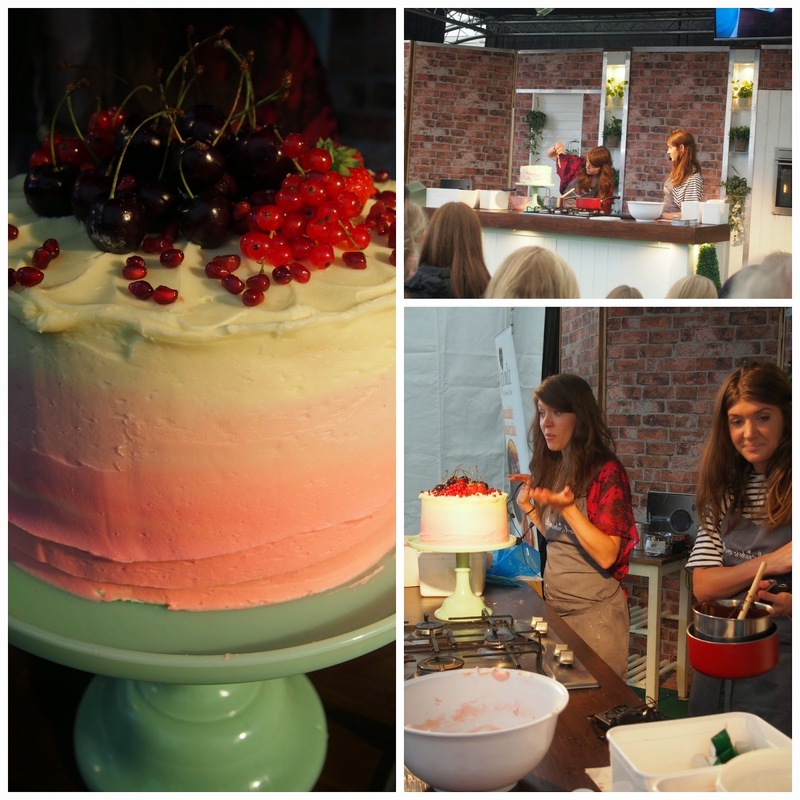 Our first demonstration in the cake tent was Absinthe Fairy Cakes made by Emilly Ladybird. Vegan cupcakes with booze. Hmmmmm, interesting! Emilly first told us about her love of steam punk and then ventured into the recipe. I'm afraid I was too busy sipping my cider to take any photos. Next up was two of the three sisters from Three Sisters Bake. The third sister is heavily pregnant, so sent her apologies. The three sisters have a Cafe and Craft Boutique in Quarrier's Village to the West of Glasgow. They had a new book published in March called Three Sisters Bake and are working on food truck as we speak. For this demonstration we were talked through making an ombre cake, which I thought was really interesting as icing cakes isn't my strong point. I don't think Andrew was as impressed. He prefers eating cake to making it. 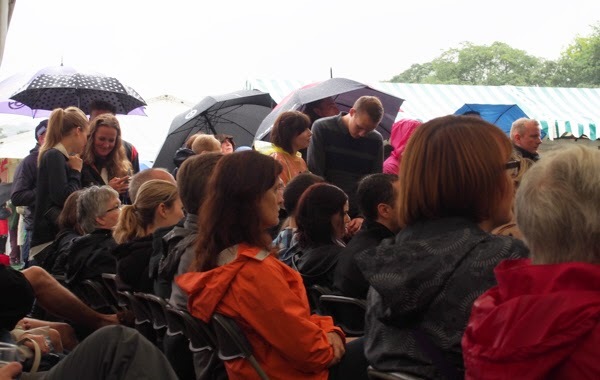 After the demonstration, we all decided we'd had enough of the torrential rain and bid each other goodbye. Andrew and I squelched around the site to see what was on offer. It was a bit half-hearted as it was still raining heavily. 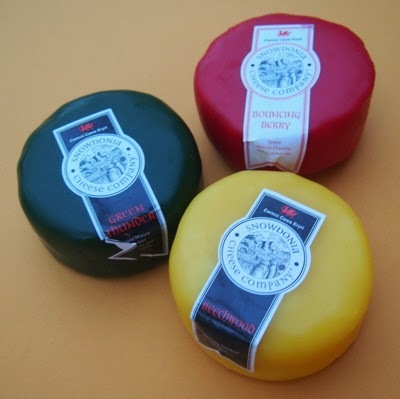 I did buy some rather tasty cheese from The Snowdonia Cheese Company and a new brush for my garlic plate. Oh and I was delighted to see Charlotte Flowers was there with her gorgeous chocolates, so I popped across for a chat and stocked up on their dark chocolate shards. Happy days! Poor Graham and Cooper got caught in the rain at the Botanics and were sheltering in the car. Graham was in a very grumpy mood abut having one very wet foot, so once we got back to the car I decided food was in order. I had a look through the free food and drink guide we were handed out at the festival and found a vegan cafe to visit, called The Forest Cafe. It had great reviews so I popped the postcode into my phone and off we went. It was easy to find, but we drove round the block a few times before finding a parking space. Inside it was very arty with painted walls, decorated tables, odd chairs a blackboard with the menu. Andrew, Graham and I had enchiladas (Graham's were vegan) and Cooper decided just to have falafel on a wrap with just a little hummus. The enchiladas were giant with a dressed side salad, rice and potato salad. Just what we needed. Although I didn't manage all of mine. We were shattered by the time we got home and all ready to head to bed. It was a fun weekend, but it would have been better if the weather had been on our side. I'll definitely return next year, but I'll be crossing my fingers for sunshine. Disclosure: Premier Inn gave me a complimentary stay and spending money for the festival. I already had a press pass courtesy of the Festival. I was not expected to write a positive review and any opinions expressed are my own. Such a shame it was so wet! Lovely to meet you though' and I'm heading yo that Handmade Burger place pretty sharpish, never been! We really enjoyed our burgers and fabulous views, don't bother with the chips though. I was underwhelmed by them. Guilty as charged! Maybe if everything hadn't been pre-made I'd have been more impressed! 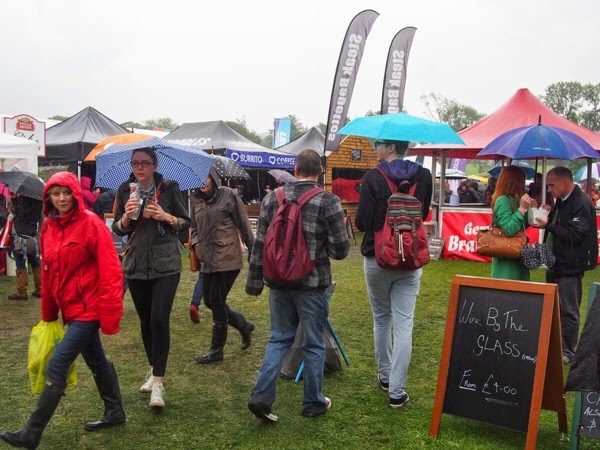 It looks a bit wet but you can't beat a good food festival!! It was rather wet and it did spoil it. I think it would have been great fun with some sunshine. shame the weather put a dampener on it - I guess always a risk in the UK but you would have hoped a summer event would work out ok! and a little weekend trip for you guys ! This looks lovely! Hopefully next year I could combine this with a trip to the Fringe. Love Edinburgh as a place to visit. It's a fabulous city and one of my favourite places. A trip to the city, a show at the Fringe and the Foodies Festival sounds like a wonderful plan! Thanks for the link Shaheen. It's it funny out of all the places in Edinburgh, you me and Kellie have all visited the cafe.? There must be hundreds in Edinburgh. Different hotel? I think there may be two in Leith. Ah, looks like some fun was had despite the rain. I haven't been for a couple of years and will definitely be making a big effort to go next year. Like Shaheen, I'm pretty sure I've eaten at The Forest but I guess it was before it moved. It's obviously a well known place. I wonder how I've missed it all these years. Nobody likes a wet foot. Poor Graham! So sad the rain was torrential as it was! Looking forward to next year already!